↤ 1 Blake references are to David V. Erdman, ed., The Poetry and Prose of William Blake, 3rd printing rev. (Garden City, N.Y.: Doubleday, 1968); here pp. 312-13. Into mild currents as the water mingles with the wine. This passage, a type of the cosmogonic moment variously presented by Blake, has largely been passed over in the silence accorded self-evident meaning, or when discussed, glided through with such selective paraphrase and assured comment as to belie any but an undemanding significance.2↤ 2 D. J. Sloss and J. P. R. Wallis remarked in their edition (speaking specifically of the second verse grouping) that, “This passage presents some difficulty, if, as elsewhere . . . a definitely mental significance is to be read into this myth. For it is impossible to reconcile the intellectual light with the obscurantism denoted by Urizen himself, and manifested in the creation of his new world. It may be therefore that the reference is to the light of the sun, not to mental light”; The Prophetic Writings of William Blake (Oxford: Clarendon, 1926), I, 180 n. Milton O. Percival states simply that “The looms weave the spiritual clothing”; while, on the other hand, “The net of the moral law is beginning to take shape”; William Blake’s Circle of Destiny (1938; rpt. New York: Octagon Books, 1970), p. 63. Erdman sees “the caverns of manufactory” where children are represented by “silkworms” and spiders, and notes the appearance of Blake’s “favorite theme, the spinning and twisting by the weak of the ‘gins & traps’ of Church and State propaganda”; Blake: Prophet Against Empire, rev. ed. (Garden City, N.Y.: Doubleday, 1969), pp. 335-36. The three sections present a nearly simultaneous temporal unity (“And all the time. . . . While. . . . While”) strongly grounded in a sequence of interrelated images, already suggesting to the painstaking reader that the passage is structured around a coherent underlying meaning. Vala or The Four Zoas, p. 29. London, British Museum. begin page 82 | ↑ back to top ↤ 3 Richard Blackmore, The Creation: A Philosophical Poem in Seven Books, in The Works of the English Poets. with Prefaces, Biographical and Critical by Samuel Johnson, vol. 24 (London: J. Nichols et al., 1779). Its threads, the hand that drew them out so fine. The Caverns then, as the site of this mental manufacture, contain the mind-loom in its perceptual and physical shell.5↤ 5 “Caverns,” moreover, glance at the received idea that the atmospheres were made underground: “ . . . by the continual fermentations made in the bowels of the earth there are aerial substances raised out of all kinds of bodies, all which together make the atmosphere,” wrote Newton; I. Bernard Cohen, ed., Isaac Newton’s Papers and Letters On Natural Philosophy and related documents, assisted by Robert E. Schofield, with explanatory prefaces by Marie Boas, Charles Coulston Gillispie, Thomas S. Kuhn, and Perry Miller (Cambridge, Mass. : Harvard Univ. Press, 1958), p. 253. Chamber’s Cyclopedia defined “atmosphere” as that part of air “which receives vapours and exhalations” (1751, OED). In Night the Ninth, Urizen and family “pourd their light / To exhale the spirits of Luvah & Vala thro the atmosphere” (131.33-34). “Beneath” the caverns is without, the vast unknown of the unconscious. The Marriage of Heaven and Hell presents a similar transition: “an Eagle with wings and feathers of air, he caused the inside of the cave to be infinite” (pl. 15). This mental space was entered by Er at the end of the Republic in one of the earliest journeys through the unknown. There he saw “the light which binds heaven” and, hanging from its extremities, “the spindle [atraktos] of Necessity” and its “weight” [sphondulos] (616c ff., cf. Milton 35. 14-15). The “Atmospheres” offer a later instance of that myth. Ostensibly as natural as the air we breathe, the “Atmospheres” are in fact woven by “the Spider,” known for his entrapping web of thought, and the “Worm,” who otherwise spins the veiling cocoon of “silken thought” (cf. Night Thoughts, 1.157-58). The close proximity of the formulaic “wingd shuttle” to the “wing’d Eagles” intimates that those “Human forms” are being manipulated by the “Spider” and “Worm,” an impression strengthened by the fact that the Eagles “bend,” where those weavers “plied”—a very rare verb for Blake, a significant meaning of which was “to bend.”6↤ 6 Ply, “bend,” and ply, “employ,” are distinct verbs; the former, although now rare, rates an entry half the length of the latter in the OED. Both shuttle and Eagles are moving back and forth filling up space. These eagles suggest the great scientists of the century, like Halley and Newton, who, even in life, were very commonly presented as pursuing extramundane, cosmic voyages of intellect.7↤ 7 William Powell Jones quotes a number of examples in his The Rhetoric of Science: A Study of Scientific Ideas and Imagery in Eighteenth-Century English Poetry (Berkeley & Los Angeles: Univ. of California Press, 1966), pp. 99-103; see also Marjorie Hope Nicolson, Newton Demands the Muse: Newton’s “Opticks” and the Eighteenth Century Poets, Princeton Paperback (1946; rpt. Princeton: Princeton Univ. Press, 1966), p. 68. One high point of the tradition is Wordsworth’s image of Newton as “a mind for ever / Voyaging through strange seas of Thought, alone” (Prelude 3.62-63). Here Blake sees them drawing their threads or theories of aethereal atmosphere behind them—bringing not light, but darkness visible. This point is confirmed by the application of the remaining three instances of “venturous” to the spider-scientist Urizen, whose “dire Web / Followed behind him” (73.31-32)8↤ 8 This web can represent a different aspect of perceptual entrapment, based on schematic diagrams of the solar system. in his exploration of the Abyss at the end of Night the Sixth (also the only Night where “the vast unknown” reappears): ↤ 9 The variant form describing “the ventrous feet / Of Urizen” (FZ 125.12-13) associates venturing with “giving birth” via “venter,” the womb, and the spectre’s podalic birth (FZ 5.15). “Venturous” also represents one of Urizen’s many associations with Milton’s Satan (cf. PL 5.64, 9.690) and his flight through the Abyss. This work parallels the Lord’s instructions to Moses that His temple is to be furnished with pillars and hooks of gold from which to hang “the vail that shall divide unto you between the holy place and the most holy” (Ex. 26:32, 33, et al.). In Night the Second the golden hooks are suns. The woven Atmospheres/curtains which serve also as “the vehicles of light” suggest Newton’s formulation of “an ethereal medium, much of the same constitution with air, but far rarer, subtler, and more strongly elastic” (Cohen, p. 179). The Book of Los speaks of “Light. . . . conducted by fluid so pure” (5.10-11). Upon the Heavens, and now they are his own. 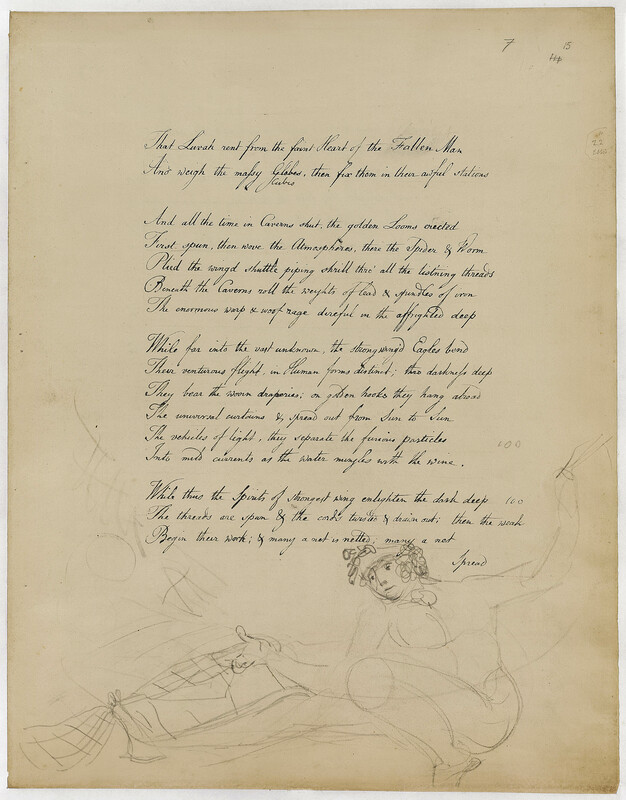 (“The first Anniversary,” 278-80) Blake draws attention to the luminescent component of the image by twice repeating in a single line the “cruel delight” of these activities. The nets of the weak “trap the listeners” and catch “many a Spirit,” condensing their “strong energies.” The Spirits caught are evidently those same “strong wing’d Eagles. . . . spirits of strongest wing” that originally spread the curtains (now nets), while the trapped listeners are those “list’ning threads” through which the wingd shuttle plied. So the spirits are bound in the web they thought to spread and the listeners are woven into what they heard. This single instance of “inspiriting” indicates that the lyres are to do more than “uplift moods.” Los must play the lyre to draw spirits into the furnaces of Urizen he is rebuilding; their bound energy is necessary to fuel his work of constructing the fallen world. The subtil particles in an Orb. The illustration shows that sun to be “black but shining” (SL 8, MHH 18). Urizen reveals in Night the Sixth that when “death” shuts up his powers, he is “then a seed in the vast womb of darkness” (73.8-9)—misremembering his ruined furnaces and “stoned stupor” of Night the Fourth. (11. 9-10) Blake told Crabb Robinson that he had seen “the Spiritual Sun” on Primrose Hill (G. E. Bentley, Jr., Blake Records [Oxford: Clarendon, 1969], p. 541). The “assertion that the spiritual Sun is not Life” (e.g., according to Swedenborg it is from the Lord but not the Lord, so “not life in itself”) annotated Blake, “explains how the natural Sun is dead” (p. 268). In addition to the Lord’s presenting himself “as to Love by Heat, as to Wisdom by Light,” Swedenborg adds another correspondence, that of “use,” presented “by the Atmosphere” (no. 299, p. 271). Atmosphere is invoked because it is “the Continent of Heat and Light” as Use is “Of Love and Wisdom” (ibid.). Thus the Atmosphere is the necessary element “by means of” which the Spiritual Sun “produces the varieties of all Things in the created Universe” (no. 300, p. 273). There are three Atmospheres in both the Spiritual and Natural Worlds, which “in descending decrease,” that is, “become continually more compressed and more inert” until “they are no longer Atmospheres but Substances” (no. 302, p. 274). Swedenborg reiterates that “the Substances and Matter, of which Earths consist . . . are, as it were, the Ends and Terminations of the Atmospheres” (no. 305, p. 277). These substances, however, still “have brought with them by Continuation from the Substance of the spiritual Sun that which was there from the Divine” and as a result continue to manifest “a perpetual Endeavour to produce Forms of Uses” (no. 310, p. 280). “The begin page 84 | ↑ back to top first Production of those Earths, when they were still recent, and in their Simplicity, was the Production of Seeds” (no. 312, p. 283). The Seeds, in turn, become an “image of creation” moving from their “first Principles to their Ultimates,” a movement characterized in Blake’s annotation as “A Going forth & returning” (p. 285), a perception which underlies his whole work. “This World is too poor to produce one Seed,” Blake wrote in the margins of Reynold’s Discourses on Art (E 646), and returning to the image in The Four Zoas, we see that the effect of the Atmosphere is to catch the Spirits of the Spiritual Sun and condense them into seeds. Perhaps the whole frame of nature may be nothing but various contextures of some certain aethereal spirits, or vapours, condensed as it were by precipitation, much after the manner, that vapours are condensed into water, or exhalations into grosser substances, though not so easily condensible; and after condensation wrought into various forms; at first by the immediate hand of the Creator; and ever since by the power of nature; which, by virtue of the command, increase and multiply, became a complete imitator of the copies set her by the protoplast. Thus perhaps may all things be originated from aether. In one of the last “Queries” added to the Opticks Newton limited himself to suggesting that “The changing of Bodies into Light, and Light into Bodies, is very conformable to the Course of Nature, which seems delighted with Transmutations.”17↤ 17 Isaac Newton, Opticks: or A Treatise of the Reflections, Refractions, Inflections and Colours of Light; fore. Albert Einstein; intro. Edmund Whittaker; pref. I. Bernard Cohen; table of contents, Duane H. D. Roller; based on the 4th ed., London, 1730 (New York: Dover, 1952), p. 374. Cf. Ault’s peculiar remark: “Blake, by taking things spiritual and mental and causing the Newtonian figures in his myth to condense and contract them into solids, is in this way criticizing Newton’s doctrine that there could be no such transformation” (p. 88). These two accounts may mark the distinction between “Science” and “Sweet Science” which operates in The Four Zoas. Newton withheld his idea from publication; “The fact is,” observes E. A. Burtt, “Newton’s positivism was powerful enough to prevent his carrying his speculations very far in this direction.”18↤ 18 Edwin Arthur[e] Burtt, The Metaphysical Foundations of Modern Physical Science, 2nd ed. rev., Anchor Books (1932; rpt. Garden City, N. Y.: Doubleday, 1954), p. 282. This for Blake is “Science,” the suspension of belief and emphasis on doubt in the interests of the profitability and utility of experimental results. Swedenborg, on the other hand, though he “has not written one new truth” (MHH 22) is a practitioner of the “Sweet Science” of belief and imaginative relation to the world. The distinction, ultimately, has to do with the place of man in the scientific endeavor; for Newton, “Man exists to know and applaud” (Burtt, p. 297) the order of the God of Nature in His unchanging laws, whereas for Blake the Imagination is to realize itself as the Being that instituted Nature and continually bodies forth new creations. The use of the term “Science” for both endeavors shows that the two will eventually be one. Both Newton and Swedenborg say that the aethereal condenses in the atmosphere, so that the physical world is, literally, spiritual. But while Newton imagines no purpose for the “transmutations,” Blake sees in Swedenborg a vision of “a going forth & returning,” the circulating, spiraling, expanding movement of the imagination. At the close of the atmospheric moment in Night the Second some of the Spirits are shown condensed into seed to be sown, others condensed into roots, already harvested and stored in “barns & garners,” the “store house” of thought (cf. 110[1st]. 12-13). The seeds may be new thoughts—spiritual energy and enlightenment caught up in an image that will grow and bear—as the roots may be accomplished thought, the organic base for further visions which, Blake says, are always of “somewhat on earth.”19↤ 19 Ann. Lavater, E 590; the single instance of “bulbous” eliminates any possibility for the frequently negative associations involved with “roots.” “The Imaginative Image,” writes Blake, “returns by the seed of contemplative Thought” (VLJ, E 545; cf. J 85.27-29). In The Four Zoas it is the passage through atmosphere that materializes the image.
. . . fine spun Air? To Souls celestial. . . . Rang sweet the praise of industry. The sun perceptible is now the spiritual sun, and the earth itself is luminous with the fresh airs of “sweet Science” sweeping away the stale atmosphere of binding “dark Religions” (139.10). The Four Zoas, p. 27 (detail). London, British Museum.